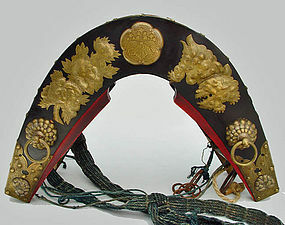 This kura (saddle) was used in the rituals which took place on the first day of rice planting. The day is called hana-taue (daue), "the flower-rice planting" and it has been practiced in the southern part of Japan. The links to today’s hana-taue is listed at the end. You can hear where the Dengaku (oldest form of Japanese music) came from in the video. The metals on this saddle are all hand cut . They used to be covered with silver. The technique of silver plating on this saddle is old – it can be as old as 17th to 18th century. Dimensions: 22” wide and 10 1/2" in depth (plus 7" nobs). Circa, late Edo period (1603-1868). About Hana-Daue: Japan has been a country of agriculture and the population of farmers (includes fishermen) during the Edo period (1603-1868) was about 76 to 83 percent. The Meiji Restoration in 1868 came with westernization followed by some drastic changes. It changed laws, education, politics, military, trading, business, manufacturing, arts, even clothing and diet (most did not eat meat until then). Large farm lands that used to be owned by the government, aristocrats, and regional lords were divided into smaller lands. The study of new farming methods took place and the machines were quickly adopted. Before these changes, rice planting was a community activity which built the foundation of Japanese society. In Hana-daue, the rice is planted in the old way. The people in the community used to get together to plant rice in one day of May or June for their landlords or others. Some of them were hired temporary workers often the second, third, etc. sons of samurai (excluding the oldest son who inherited everything during the Edo period) or the owner of the cows from the different regions for plowing the land that was filled with water. The day starts with the rituals with the presence of priests. This custom was almost vanishing when the machinery took its place. Then, there were people who started to re-evaluate the good old ways often being awaken by some foreigners. The links from Youtube below show Hana-taue from the Hiroshima prefecture. It is lively. I believe that both of them are now designated as the “Important Intangible Cultural Property” by the government. One of them was nominated for a Immaterial UNESCO World Cultural Heritage. The cows were brushed and decorated with fancy saddles. You can spot the saddles on cows (many of them look newer than this one. The older ones are displayed), listen to the old folk music of farmers. You can see and hear the “saotome” (young farmer girls) singing while they plant rice. The “Hana” means flower in Japanese. The name came from the pretty view of girls singing while planting rice. It was explained that the tradition was started to make the hard work of rice planting as bearable and enjoyable. I believe that the day was reserved for their hard working companions, cows and horses. 1) Mibu’s Hana-Daue (taue, rice planing) – you can see cows with the decorative saddles (they appears newer).